95 years ago, the guns fell silent across the Western Front, as the Armistice took effect, leaving behind four years of destruction on a previously unimaginable scale. This conflict marked the lives of a generation of poets, who are studied in English literature classes in the United Kingdom. Yesterday was Remembrance Sunday, and in honour of this day, here is a lesson plan designed around one of my favourite poems from the First World War, ‘Dulce et decorum est’ by Wilfred Owen. This lesson plan is designed to last for three two- hour sessions, and is suitable for advanced students, from B2+ to C2. Session 1 – Who’s for the game? This session focuses on the early propaganda aimed at convincing the young men of Britain to join up to fight for their country as the war began. The poem we will examine is ‘Who’s for the game?‘ by Jessie Pope. As a way of introducing the theme, use the following video, which presents some of the propaganda posters used to encourage men to volunteer for the armed forces. Once you have watched the video, have the students choose one of the posters which they have seen and prepare a presentation on the persuasive elements which they find in it – not just in the use of language, but also in the images. Ask them to decide if the persuasion relies on rational arguments or on emotional reactions. You can find a wide range of propaganda posters from the First World War here. Then draw attention to the role played by women in the posters – some posters address women directly, urging them to convince their husbands and boyfriends to join up. This will provide the link to the poem for today, written by a woman but addressed to young men. Give the students a copy of the poem and allow them to read it, helping with vocabulary if necessary. Once they have finished, in pairs get them to complete a T-chart with sports terms on one side and references to the war on the other. In reality, there are few direct references to the war. Most of the images are related to something which the young men of the time would be very familiar with – the sports’ field. At this point, it is a good idea to focus on any students who are particularly sporty in the class, and ask them for their reactions to what Pope is saying. Would you really want to be left on the sidelines? Have you ever suffered an injury as a result of your sport? What was your reaction? Finally, examine the language itself, focusing on the elements which can be considered persuasive. 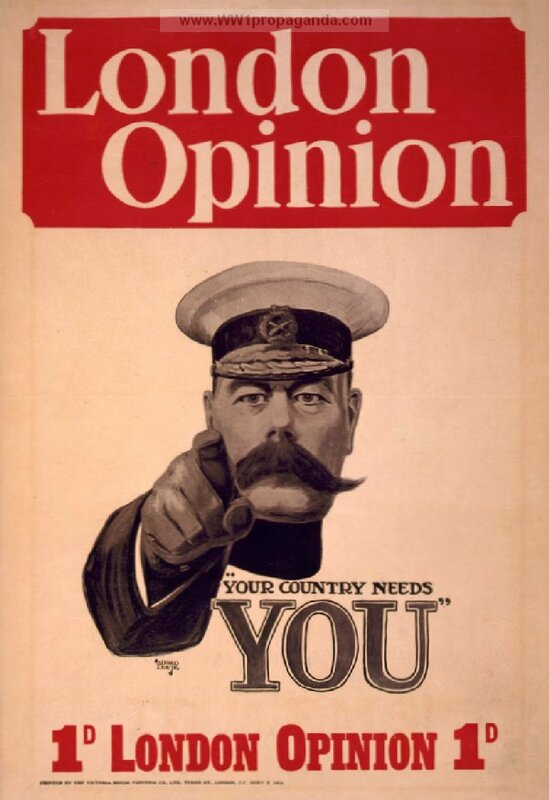 Here it is important to focus on the direct address used throughout the poem by Pope, which echoes the language and images of many of the posters seen earlier – notably the image of Kitchener pointing out of the poster at ‘YOU’ reproduced above. The informal register of the poem is also important, addressing the ‘lads’ as peers, creating the illusion of peer pressure. To work on these elements of language, you can use this worksheet. To finish the session, watch the first part of the video which will be used to start Session two, up to the point where the soldiers are on parade (0:16). This second session focuses on the reality of the war which the recruits found when they arrived at the front line. 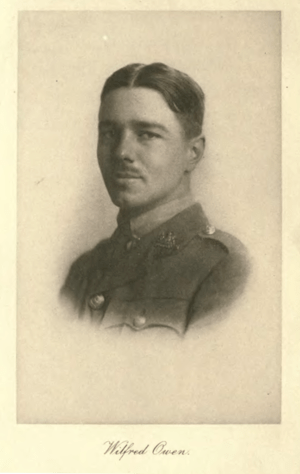 We will read a brief biography of Wilfred Owen and we will focus on his poem, ‘Dulce et decorum est pro patria mori‘. To begin the session, we return to the video which closed session 1, but this time the students should watch to the end. Ask students to give their impressions of the differences between the ideal which Pope was selling to the young men and the reality they faced on the Western Front. After a brief discussion, it is time to give the students more details about life in the trenches. The following video by Dan Snow examines the conditions that the soldiers faced in the trenches. • After experiencing war first hand, Owen became strongly anti-war. People at home had no idea of what war was like & wanted to persuade them against it. • War ended 11th November 1918 at 11 o’clock. Owen’s family received the telegram informing them of his death as the church bells of the village rang to celebrate the end of the war. Share the ideas from the pairs in class. As a final exercise, have the students compare the emotions expressed in ‘Who’s for the game?’ with those expressed by Owen in ‘Dulce et decorum est…’ Also have them look back at the propaganda posters they worked on in the first session, and include the emotions expressed there.How does the reality measure up to the propaganda? In the next post, I will present the final session in this scheme of work – ‘Lest we forget’, and possible ideas for extension. This entry was posted in Advanced, Authentic materials, Culture, Resources. Bookmark the permalink. ← Gunpowder, treason and plot … Guy Fawkes in the classroom. 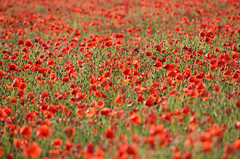 As we prepare to commemorate the centenary of the outbreak of the First World War, I thought I would revive this post which has ideas for lessons based around the poetry which grew from the horrors of war.